Container Gardening - Stage a Scene! "Container gardening is both a craft and an art." Container gardening is among the most versatile and exciting tools in the gardener's design toolbox. Using plant containers in your garden creates a unique and personal effect, with relatively little in the way of effort or cost. Do you have containers in YOUR garden? 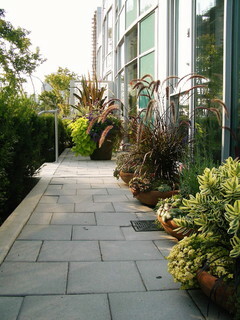 Not employing container gardening in your landscape is like leaving money in the street! The design potential is enormous. Look at the impressive list of things you can accomplish with Container Gardening! Downplay an unwanted garden "feature"
Most of us recognize the ability to add color to the garden by using planting containers. But don't stop there! How does a designer think about container gardening? Try these ideas straight from the designer's table to get the most out of your containers. Repeat color or textures throughout the landscape. 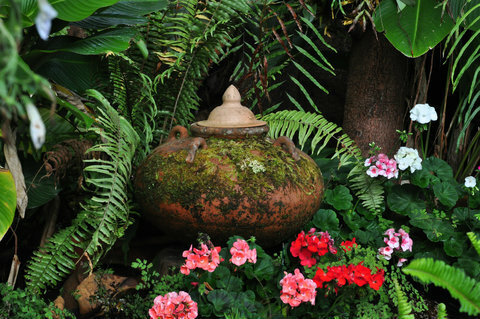 If you use a dramatic red container, use flowers, leaves, bark or garden art that also has a related red tone or use the same container throughout the garden. If you use fine leaved plantings, repeat those leaf textures throughout to help draw the eye through a garden space. Use containers to contrast or emphasize textures. 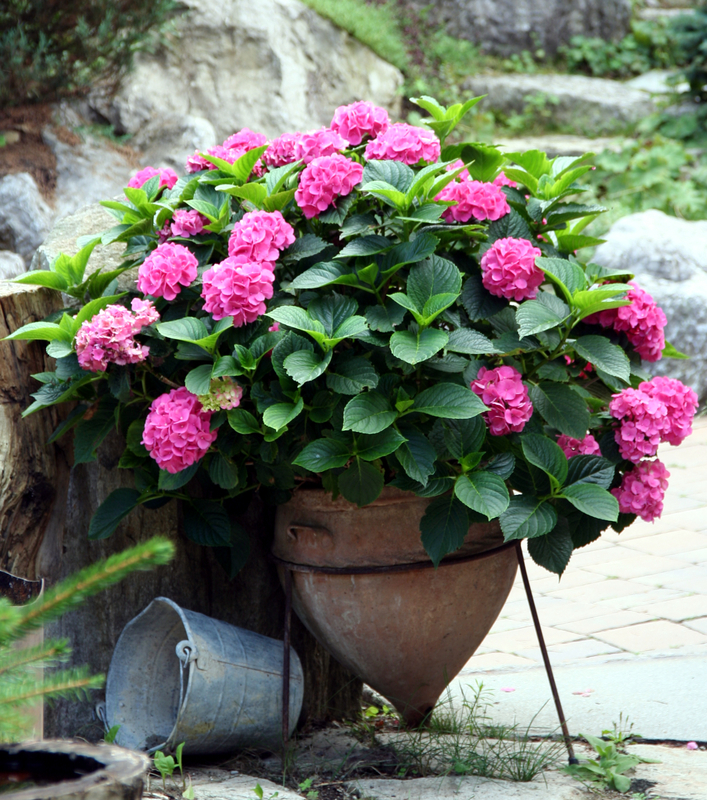 When you use plants that are rough or coarsely textured, offset them with smooth containers with strong colors. Or use smooth textures to emphasize fine leaved plantings. Offset textures or match them to create different effects in the garden. Pay attention to proportion and scale. Do you want to create a focal point? Then mass containers or oversize them to create a dramatic eye-catching display. Or do you want a smaller plant to have more stature in the garden? Pot it up and watch it inhabit more visual space. 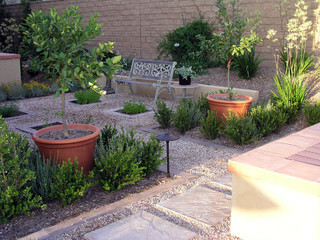 Use your creations to reinforce your overall garden design. Highlight the mood you want to create. 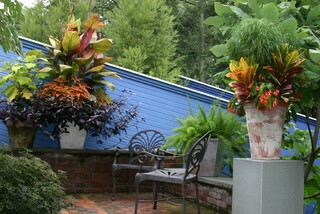 Use the color, texture, proportion and materials of your containers to alter the mood of your garden. Do you want a Tuscan design? 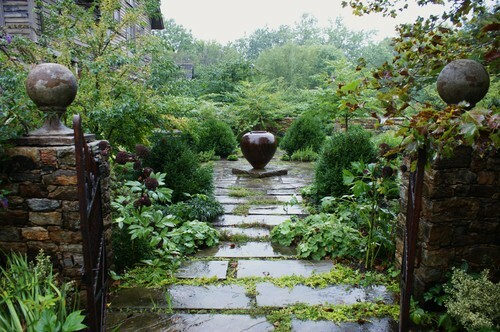 Large pots, warm clay and stone, and dramatic, oversized plantings help set the tone. Maybe you prefer a country garden style...use antiques, country and/or repurposed items and muted colors to achieve the effect. Vary the use of containers throughout the garden. Pot up a dwarf cedar or an orange tree to create garden structure, or use pots with nothing but dramatic foliage to support a tropical effect. Store garden soil in an oversize container, or hide garden tools in an old icebox. Get creative and use containers in new and different ways. 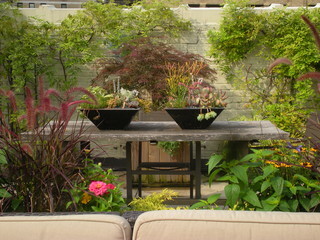 Think of your garden as a stage, and containers as props. What do you want to communicate with your overall design? Does a dark corner need a bright pop of color? 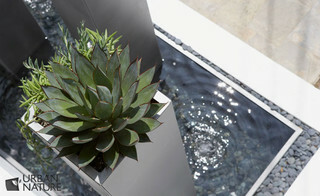 Will the use of repeated plant forms, textures, or container shapes create structure in the garden? 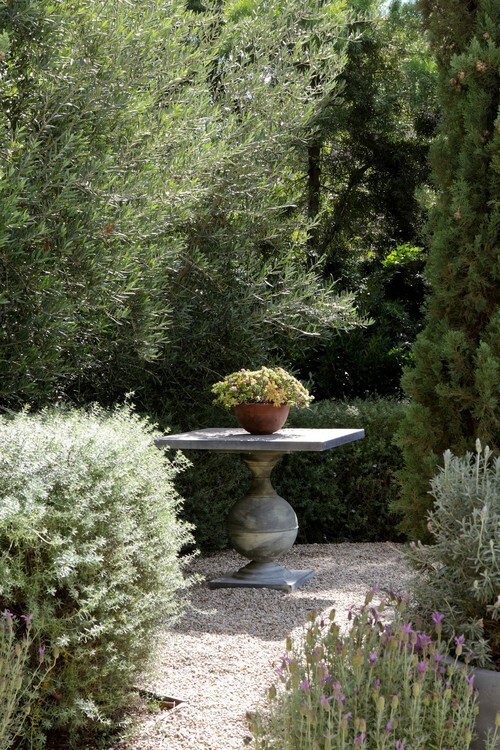 Do you need an important focal point to bring your garden together? Stage a display! Always use containers in context with the other elements of your garden. Control traffic through container placement. Would you prefer your garden guests use a particular route to access your door? Or is there a safety issue you want to eliminate? Use containers as your solution! Think vertically! Do you have a small garden space, or a huge wall you want to break up? 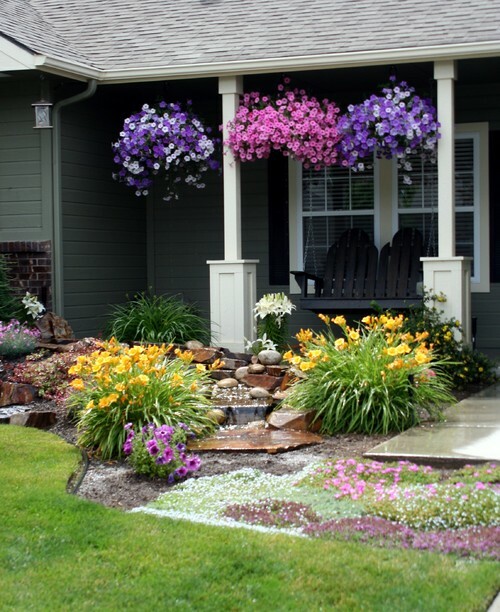 Use hanging baskets on porches, fences, and on the top of garden walls to create hanging gardens. Place containers with climbing plants or colorful accents throughout the garden to raise plants to eye level to lead the eye or create an artistic statement. The power of a few well chosen plant containers is truly miraculous! Containers, whether used specifically for plants, storage, or even for just decorative value, add another dimension and infuse personality into your design. The key to effectively using containers in your garden design is to keep in mind the overall effect you want to create in your garden space. Each decision you make will reinforce or detract from that overall effect. Dig into your closets, your garage, or your neighborhood nursery, and get started with container gardening!